Best Portable Power Supply – We are currently in a generation that consumes a ton of power every single day and we really can’t get it enough, to be honest. Think when was the last time that your mobile phone died because of low battery, not very long ago right. Then imagine how can one survive in an RV or while camping without enough power backup. 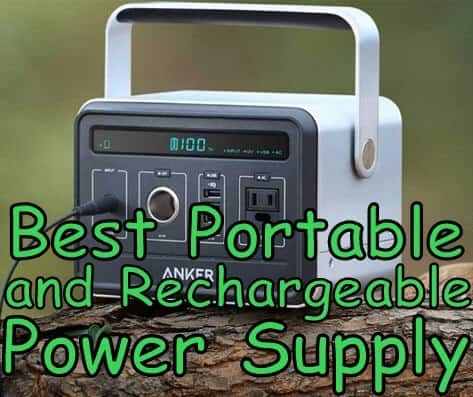 We did receive a ton of requests on to write an article on Best Portable Power supply that is rechargeable and also can be used for multiple purposes like Camping, Daily Use, On the road and much more. So in this article, we have done our research and have written the in-depth review and suggestions on the 10 best Rechargeable Portable Power Supply. Anker Powerhouse is ranked No 1 in BuyersGuideX according to all the legit research and after using the device for months, hands down this is the best portable power supply which is also rechargeable. You might be wondering why is this the best Rechargeable Portable Power Supply in the market, ill tell you. Anker is the industry leader in the power supply products. They have dominated the market with their amazing, quality products. 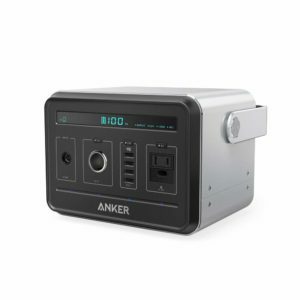 Anker Powerhouse has 434 watt-hours of power which are more than enough for most of the people. With 434 watt-hours one can charge around 40 Smartphones or 12-15 Laptops, which is quite good for this price range. This is the best Portable and also rechargeable power supply because it is pretty easy to carry and also very handy. This power supply unit can be used for both indoors and outdoors. One perfect application of this portable power supply is Long Tours such as Hiking, Camping and many more. If you are a regular camper then it is perfect for you and fits in your RV. Anker Powerhouse is equipped with four different USB ports which use the fast charging PowerIQ technology, so you can easily charge multiple devices and also have the fast charging feature which is very crucial for this day and age. You can connect your mobiles, camera, laptops, and many more at the same time. In total there 3 different outlets or outputs such as the 4 USB Ports, AC Outlet, and 12V Socket. For Camper and Trekkers, This portable power supply can power up or light up a 15V Lamp or Bulb for 110+ hours. This is the definitely the ideal power supply for campers and other outdoor activities. The built quality of this portable power supply is top notch. Anker Powerhouse is built only using High Quality, High-Grade components. The outer shell of Anker powerhouse is made up of Aluminium which is really hard to break and rigid. Anker Powerhouse uses a structural technology called BMS (Battery Management System) which is a management system undertakes voltage control, temperature control, short circuit prevention, and more advanced safety procedures, which is really important when you are working with electricity. 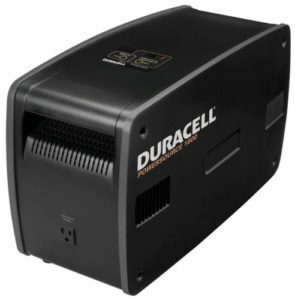 Duracell Powersource is the 2nd recommended portable power supply. Duracell is a household name, they are pioneers in the battery and power industry. This is Duracell Powersource 1800. 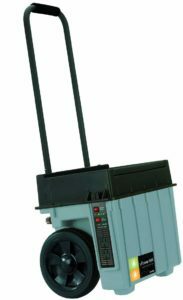 The model no 1800 is because this portable power supply has an 1800 watt inverter in it. Duracell Powersource is also equipped with five 115V AC power outlets for charging up multiple devices. It also has a built in relay that provides reliable backup power capability. The battery inside the power supply is sealed and non-spillable with 51Ah AGM battery and 3600 watts peak. Duracell Powersource is perfect for indoors and also outdoors application. We tried it on a camping trip around Idaho, United States of America in my RV and this portable and rechargeable power supply was a life saver. Not very handy, because its more on the heavier side. 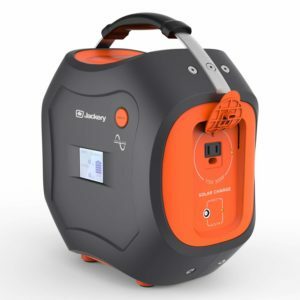 Jackery Portable Power Station is a beast! When I said beast you really need to read the description to understand how powerful it is. 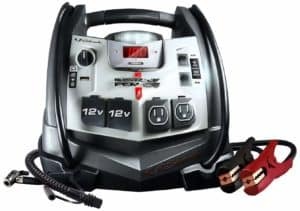 Jackery Portable Power Station is an All in one portable power station so all your friends and peers can connect to it at the same time using the multiple outlets. Jackery Powerstation is 500Wh which is very portable and with high capacity. The power station is very lightweight because of the lithium battery generator. Scientifically Lithium is very lite and at the same time very powerful too. One of my favorite feature of Jackery Power Station is the dual charging feature in it. You can charge it with Solar using the solar panel available in the power station and using the regular AC charging. This portable power supply has a 102W solar panel so it can be charged 100% with just 7 hours in the sunlight. There are two variant of it, One is Black and Orange Power Station without Solar panel and the other one is with Solar Panel. I would recommend you to buy the one with the solar panel which can be really handy in places where electricity is not available. 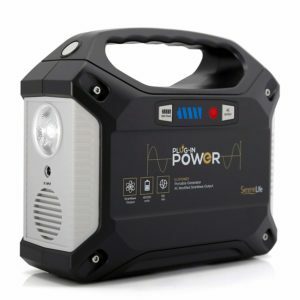 Jackery Portable Power Station has a built-in LED flashlight which is super powerful. This flashlight can be easily used while camping, hurricanes and many more situations. At bit on the pricier side. Schumacher XP2260 is a really good looking rechargeable portable power supply. Schumacher XP2260 is not just a portable power supply but also has a jump starter included in it. You can use the jump starter to jump start you charge or anything that is electronically seized. It has a built-in High-Pressure Air Compressor and also USB ports for charging the devices. Xantrex XPower is trolly kinda portable power supply. This is not really that portable but you can drag it around easily without any need to carry. That is one of the main reason for listing it here. Its very unique design and unique portability. Xantrex XPower is said to generate around 1500 watts of energy. This power supply can run major household applications such as Refridgerator, Television, Washing Machine and more. All the physical components are packed into the cart with two wheels on both the side with a handle to push or drag it around. This trolly design helps it very easy to carry around. You can drag it around different rooms or if outdoor can be used to drag it around the terrane. Xantrex XPower can be recharged with a normal household outlet. It has both AC and DC plugs. Xantrex XPower is said to be the perfect alternative to Generators. Black+Decker PPRH5B is ranked No 6 in BuyersGuideX. Black+Decker is a really popular company on the Jumpstart industry. When they entered the portable power supply company with Jumpstarted, it made a revelation with more products coming up on the line. PPRH5B has a 12 volt DC plug which allows you to connect it to any 12 or fewer volts appliance or any household appliances. This is perfect or ideal for camping or trekking or long trip in vehicles. Black+Decker PPRH5B also has USB ports which allow you to charge your mobile phone or camera with that which is pretty cool, to be honest. We called it ideal for camping or trekking because of the flashlights in the power supply unit. PPRH5B has a LED Flashlight for emergency or any other use where lights aren’t available. One unique feature that made me love this product is the portable air compressor builtin into this device. PPRH5B has a 120 PSI compressor which is pretty capable of filling the air for Bikes, Cycle, Cars, Motor Bikes or Trucks. So the next time when you are camping in your RV, you don’t need to worry about the flat tire when you are on the road. 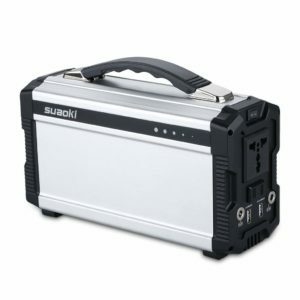 Suaoki is more of a versatile portable power supply unit. This rechargeable portable power supply device has two types of applications, one is solar application and the other one is the AC or Alternative Current Outlet Application. As it is powered by solar, it is a perfect companion for outdoor activities such as trekking or camping. It can efficiently power up Mobile Phones, Laptops, Fans, TV, Lights and much more. It also called as a “All in One” Power station because of it has AC Charging, DC Charging and USB Outlet. The battery capacity of this power supply is 60,000 mAh which is pretty huge and can be used for more than a week. Suaoki Power Supply also promotes green energy as most of its power comes from Solar energy, so if you use this you are also saving the environment. This is a really good portable and rechargeable power supply within this price range. Campbell Hausfeld CC2300, this is the first Campbell Hausfeld product in this list. 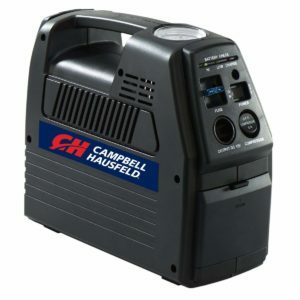 Campbell Hausfeld CC2300 is a really good portable power supply for the indoor and outdoor purpose. Campbell Hausfeld CC2300 is a rechargeable and cordless power supply. 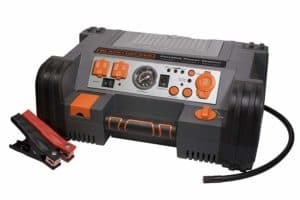 This power supply also has a built-in air inflator which helps in pumping air in the tire when it goes flat or empty. Not only the vehicle tire but we can pump air for inflatable stuff like inflatable kayak, portable swimming pool, air mattress and many more. The air inflator is just a bonus feature but this is a primary power supply so that you can charge your devices using it. You can charge any electronic devices which are of a maximum of 12 Volts. If you need a really handy power supply then this is the one because it has a handle which makes it very handy. 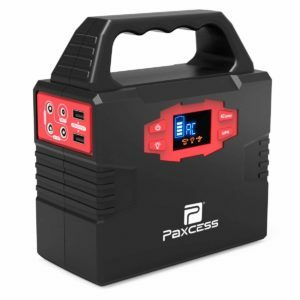 Paxcess is a really good looking Portable Power Supply. This power supply has two 110V AC for laptops, camera battery, household appliance, camping light and many more. It has three 12V DC for Car Vaccum, Car Refrigerator and many more. As a bonus, it also has two 5V USB Ports which can be used to charge mobile phones, cameras, iPads, iPods, and many more. The portability of this power supply is above standard so it would suggest you to buy if you wanted more handy power supply. Paxcess also has Display that shows the battery power, Outlet type and many more. SereneLife is the best Portable Power Supply for the price range. If you don’t have a big budget then this is the one for you. This power supply has AC, USB, and 12V DC outlets. It has two 110V AC outlets, three 12V DC ports, and three 5V USB ports. You can charge anything you want that is compatible with these three power outlets and also the required volts. SereneLife has three different charging modes, One is using a solar panel (Not Included, Sold Separately), the Second one is using the normal home charge in the wall and the last one is using the car charging which is a quite unique feature. The total capacity of this power supply is 42000mAh which is a lot and is perfect for indoor and outdoors.